Which NFL Great Loved Coppers? Y. A. Tittle? Jim Brown? Fran Tarkenton? Antonio Brown? Matt Ryan? I’m sitting here, slightly missing the National Football League this 2018 season . . . and I’m thinking. This image of a tiny copper butterfly, Lycaena thersamon omphale got me to thinking, how do 6′ 3″ tall men, and 5′ 11″ tall women shoot such diminutive butterflies. This guy was seen in a small moshav (village) on the slope of Israel’s Mt. Hermon. I wanted those 2016 images to include coppers nectaring with their wings open. I spent those 3 mornings trying to capture that and some other scenarios. Remember, I shoot Fuji slide film, and use a Canon 100mm/2.8 lens (this was my first one, not equipped with Image Stabilization). Working with a Macro- lens necessitates getting some 18″ or so from the copper, that a feat in and of itself. So you approach, you all bent over, or like me kneeling on my left knee, on my Tommy kneepad. He flies to a bloom 2 feet away, you follow, going down again, again he flies, and again . . . This for 3 hours in the early morning! Stir in the added feature: the sun drenching you in hot, sunburn waves, and ask yourself: How does a guy like Peyton Manning, touted at 6′ 5″ . . . photograph copper butterflies in the Israeli Golan? Share what you know please. A Why? Butterfly. Seen in April on the slope of Mt. Hermon, Israel. 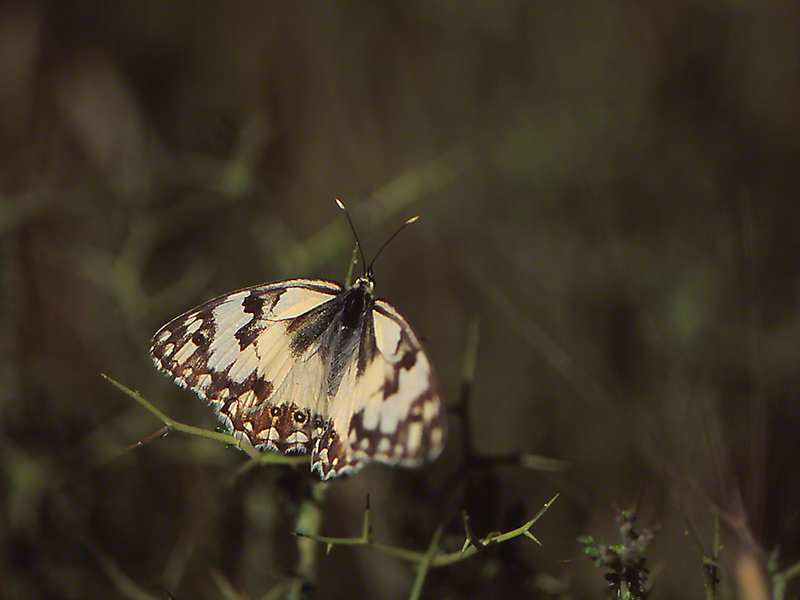 You’re likely to give this Levantine Marbled White the two second look that most white butterflies complain of. Look again There’s something different here. Examine those hindwings. See them? Those two “eyes?” Our white butterflies don’t boast “eyes.” If it’s not a white butterfly, like our Cabbage white . . . what group of butterflies does it belong to? Levantine Marbleds are Satyrs. Hmm. Are there any white U.S.A. Satyr butterflies?